Monfort, who has been acting director since 2017, assumes the directorship Sept. 17. Steven Monfort has been named the John and Adrienne Mars Director, Smithsonian’s National Zoo and Conservation Biology Institute, effective Sept. 17. Monfort has served as acting director of the Zoo since the retirement of Dennis Kelly in November 2017. Since 2006, Monfort has served as director of the Smithsonian Conservation Biology Institute (SCBI). As director, Monfort will oversee the 163-acre facility in Rock Creek Park and the 3,200-acre SCBI campus in Front Royal, Virginia. He will be responsible for the operations of the public Zoo in Washington, which has approximately 1.8 million visitors a year, and manage the Zoo’s groundbreaking conservation biology research team that works in more than 30 countries. Monfort will also oversee educational programs, ticketed events and other services coordinated by Friends of the National Zoo, the Zoo’s non-profit partner. The Zoo has 321 full-time staff positions, including keepers, curators, scientists and administrative staff and a combined federal and non-federal budget for fiscal year 2018 of $45 million. Major exhibits at the Zoo include Asia Trail, the David M. Rubenstein Family Giant Panda Habitat, Cheetah Conservation Station, Elephant Trails, Small Mammal House, Great Apes, Reptile Discovery Center, Great Cats, American Trail, Amazonia and the Kids’ Farm. The work of its scientists has made the National Zoo and Conservation Biology Institute a global leader in species’ conservation, particularly in the fields of veterinary medicine, reproductive biology, genetics and ecology. In addition to notable recent births at the Zoo, such as Moke the gorilla, the Zoo’s programs for giant pandas, Asian elephants, amphibians and cheetahs, to name a few, illustrate how the Zoo integrates science, field research and education outreach to ensure a successful future for over 300 species. SCBI spearheads research programs at its headquarters in Front Royal (home to 20 species), the Zoo and at field research stations and training sites in 30 countries. SCBI scientists tackle some of today’s most complex conservation challenges by applying and sharing what they learn in disciplines such as wildlife ecology, forest/climate-change research, genetics/genomics, reproductive sciences and zoo biology. Monfort has been affiliated with the Zoo since 1986, when he founded the Zoo’s Endocrinology Research Laboratory, which has become one of the most respected wildlife endocrinology programs in the world. The laboratory is dedicated to monitoring hormones for assessing reproductive health and well-being in diverse wildlife species. In 2006, he became the Zoo’s associate director for conservation and science, supervising approximately 100 research scientists, research veterinarians, technicians, support staff, post-doctoral fellows, graduate students and research interns located at the Zoo’s Rock Creek and Front Royal facilities, established in 1974. Monfort co-founded the Institution-wide Conservation Commons, which unites Smithsonian researchers in tacking complex conservation problems on a global scale. Through its Earth Optimism Summit, the Commons seeks to highlight and share stories of conservation success. Monfort also established an innovative undergraduate conservation-education program through a partnership with George Mason University, which led to the interdisciplinary, in-residence conservation program—the Smithsonian-Mason Semester in Conservation Studies—on the Front Royal campus. In 2009, Monfort co-founded the Global Tiger Initiative with the World Bank Group in an effort to double the world’s tiger populations by 2022. He is an affiliate professor at George Mason, co-founder and board chair emeritus of the Sahara Conservation Fund and is a member of the International Union for Conservation of Nature’s antelope, cervid (deer) and conservation breeding specialists groups. Monfort has published more than 100 peer-reviewed scientific papers in the broad discipline of reproductive biology. 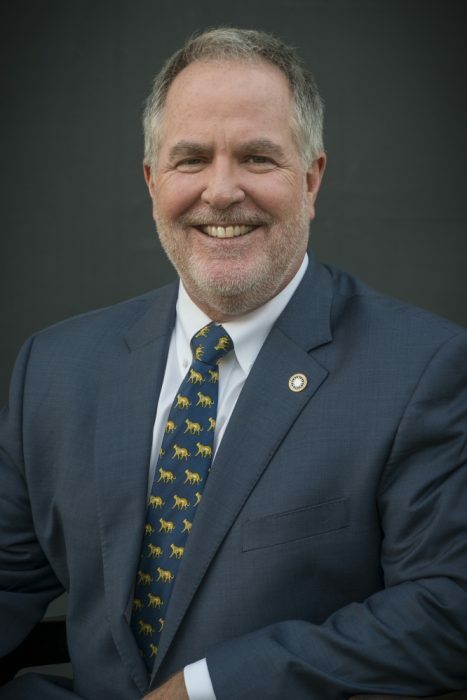 He received Master of Science and Doctor of Veterinary Medicine degrees from the University of California, Davis and his doctorate in Environmental Science and Public Policy from George Mason University. The Torch relies on contributions from the entire Smithsonian community.